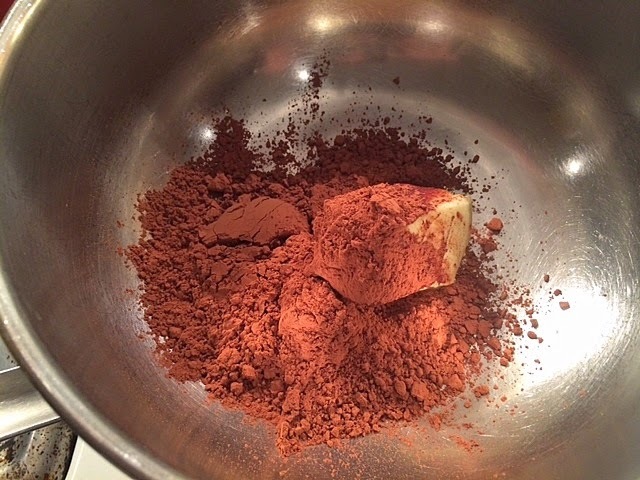 Last weekend, while making a peach pie, the DS asked me to "please make something chocolate." 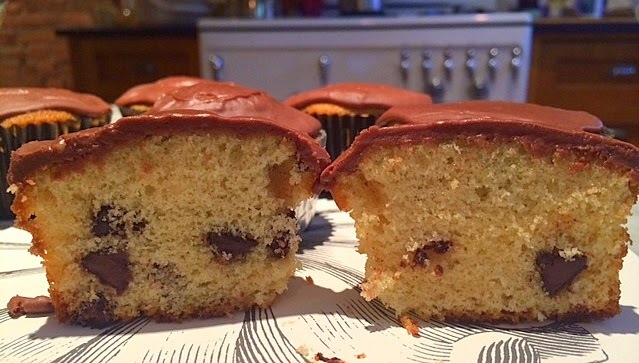 So, being the aim-to-please mother that I am, I whipped up these chocolate chip cupcakes. 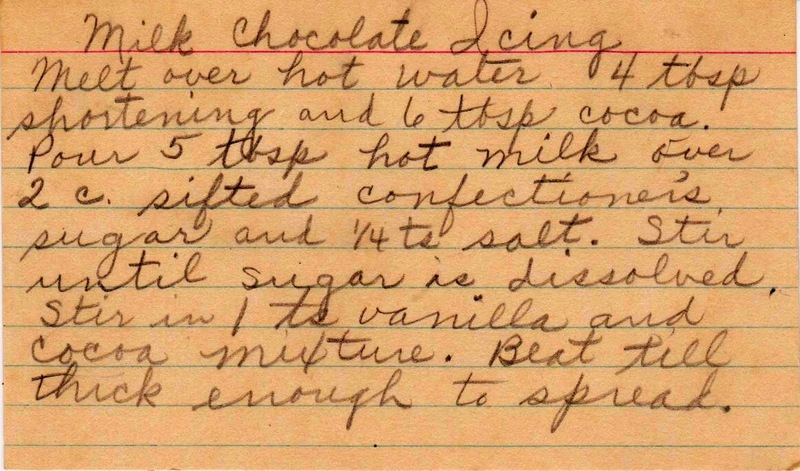 The vintage recipe predates commercial chocolate chips -- as in, it calls for breaking up a seven-ounce chocolate bar. 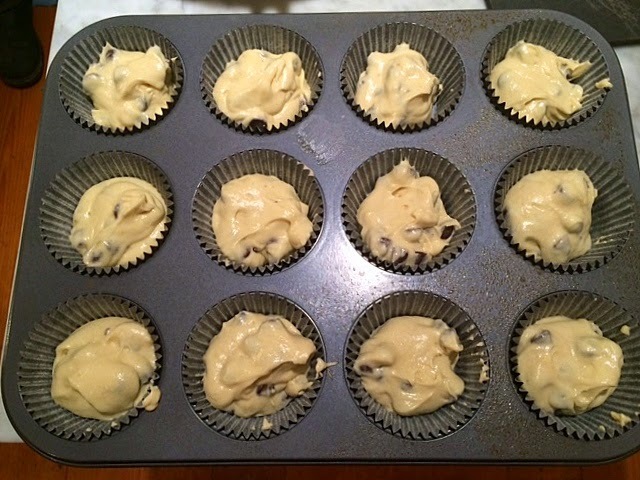 (Chocolate chips were introduced commercially in 1939.) 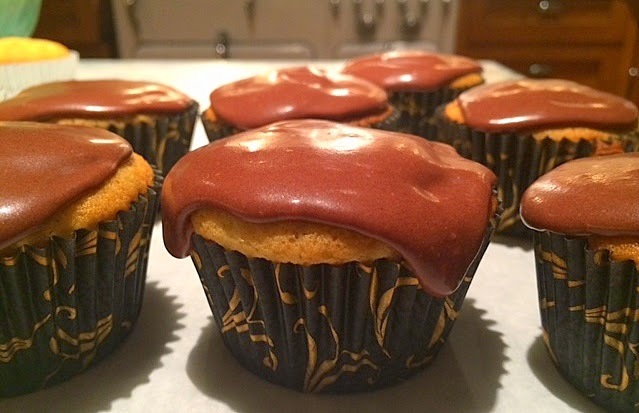 Because these are old-school (read: not overly sweet or chocolate-y) I paired them with a very rich milk chocolate frosting. These are good, not great, though the DH ate several and especially liked the frosting. The best news is, they can be made quickly (like while simultaneously baking a pie) with ingredients probably in your pantry. 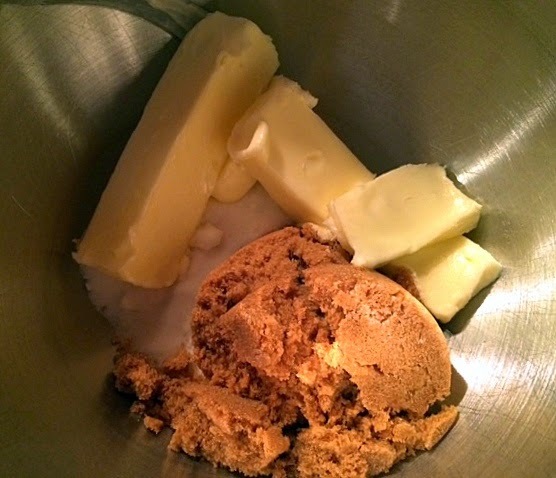 Start by blending the butter with the sugar. 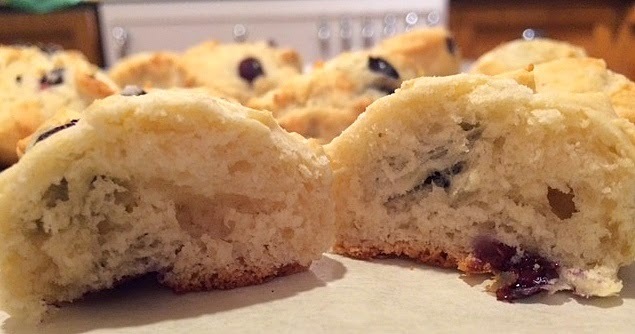 When the batter is done, fill paper-lined muffin tins. While the cupcakes are baking, begin the frositng by melting butter and cocoa. Add the melted chocolate mixture to the milk and confectioner's sugar mixture. 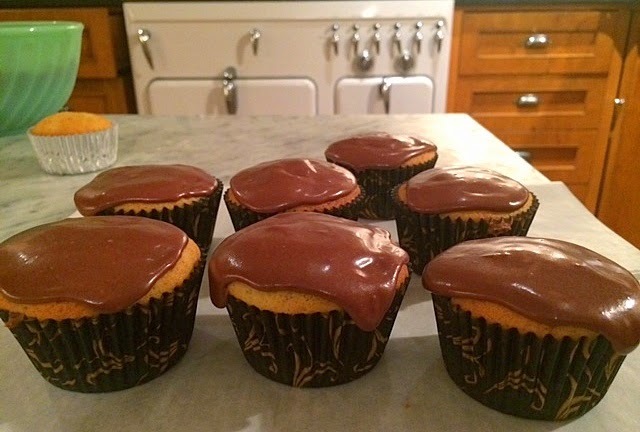 Beat and voila -- milk chocolate frosting. This inside view reveals the chocolate to cake ratio. 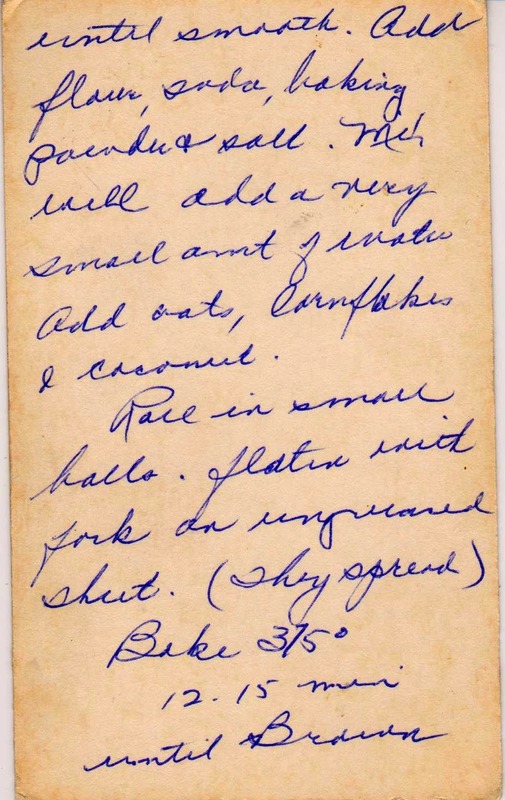 Recipes are below; I've written out an updated method for the cupcakes, as there are no instructions on the card. 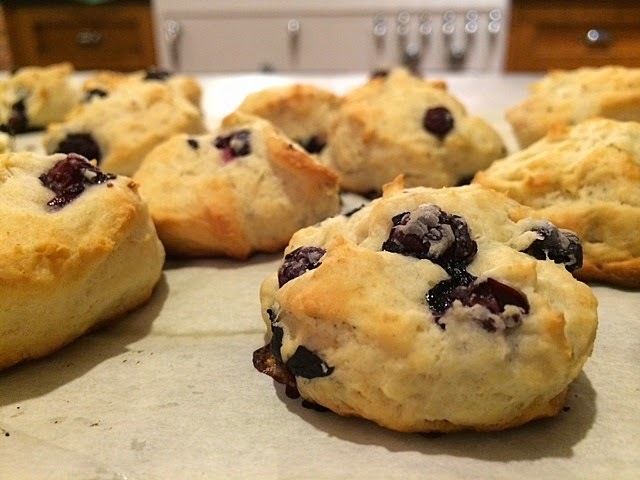 Beat butter with sugar until light and fluffy. 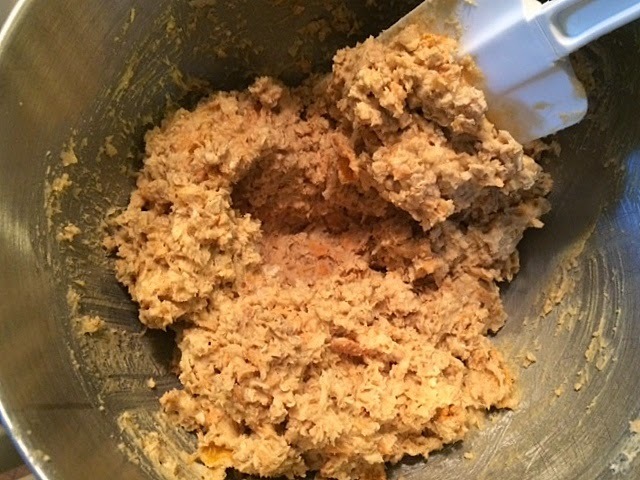 Add dry mixture alternately with the milk, beginning and ending with the flour mixture. Bake about 20 minutes or until a tester (toothpick) comes out clean. 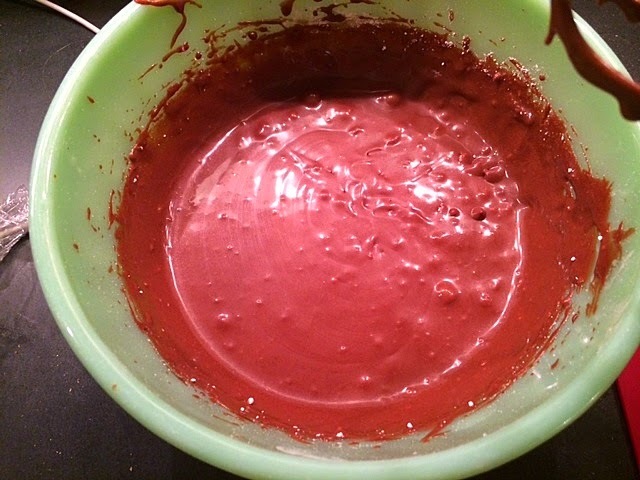 For the icing, melt butter (instead of shortening) and cocoa powder in a double boiler over hot water. I had to add extra confectioner's sugar to get it thick enough to spread. 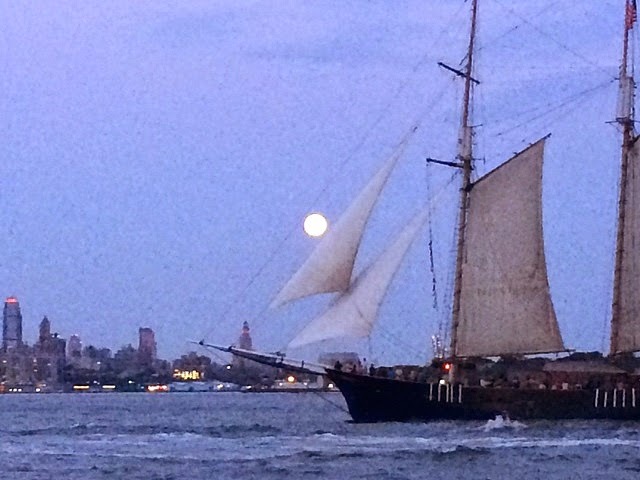 You know that saying: Listen to your gut? 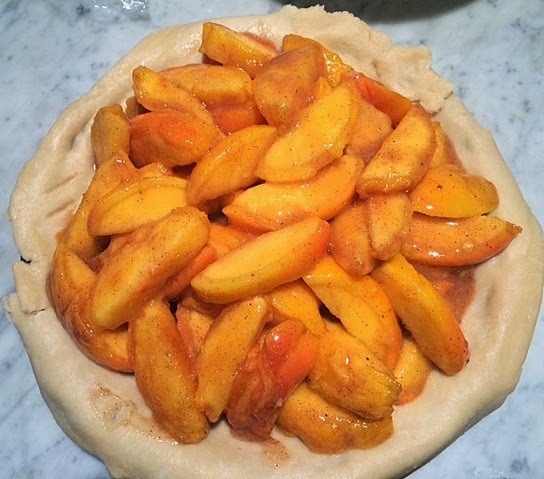 On Saturday, I didn't and ended up with a disappointing mess of a peach pie (though a night in the refrigerator somewhat improved things). 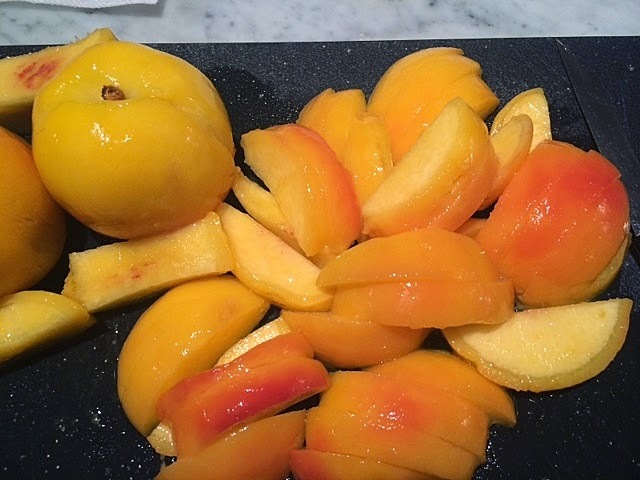 It all began at the farmer's market, where I purchased some gorgeous peaches intending to make a peach cobbler for that night's barbecue. But after discovering that I had made (and written about) peach cobbler three times, decided to bake those beauties into a pie. 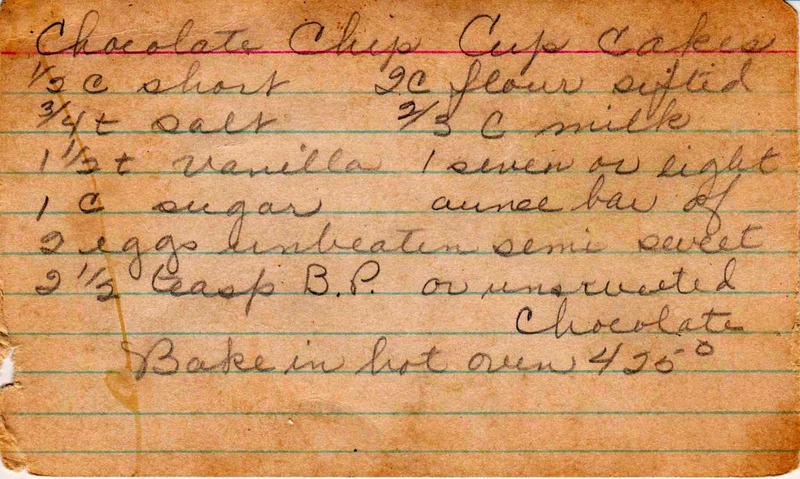 I couldn't find a hand-written recipe in my collection, but I did find the next best thing: a clipped recipe from an old newspaper carefully glued to a recipe card. The venture began well. 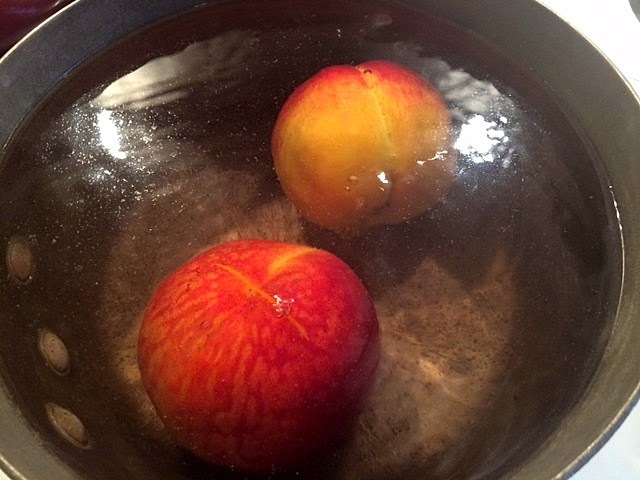 I dropped the peaches (in batches) into boiling water for a minute or two, so as to loosen their skins . . .
which slipped off easily after running the fruit under some cold water. after coating them with sugar, flour, cinnamon and nutmeg, placed them in a pastry-lined pie pan. 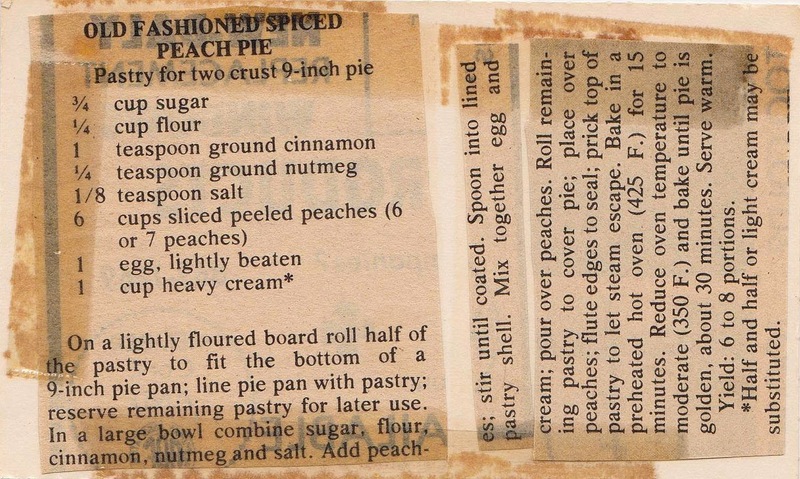 And then, against every instinct I had, I followed the recipe and poured nearly one cup of cream mixed with a beaten egg over the peaches. 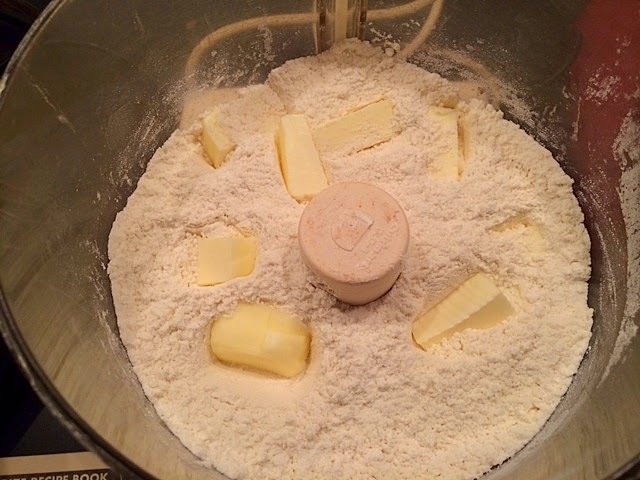 Pie bakers know that one adds thickener (flour, tapioca, cornstarch, etc.) 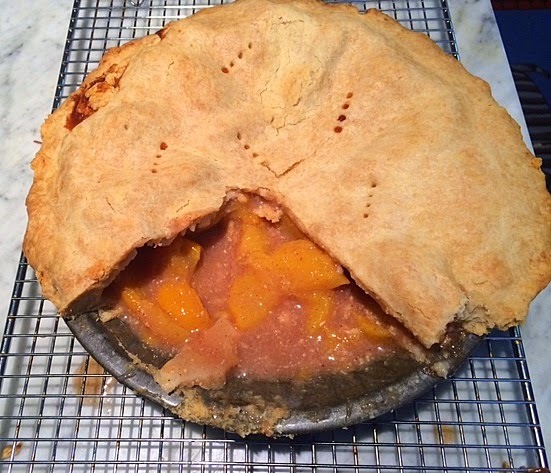 to fruit pies to absorb the juices released from fruit -- and here this recipe called for adding liquid, and a lot of it! Can anyone say counter-intuitive? The liquid poured out of the shell faster than I could contain it. You can see below just a bit of the mess it created. I was too busy trying to stop the flood from reaching the floor to take more pictures, but you get the idea. I couldn't serve the pie that night. It was still very warm from the oven, so I quickly made chocolate chip cupcakes with milk chocolate frosting (subject of a future post). 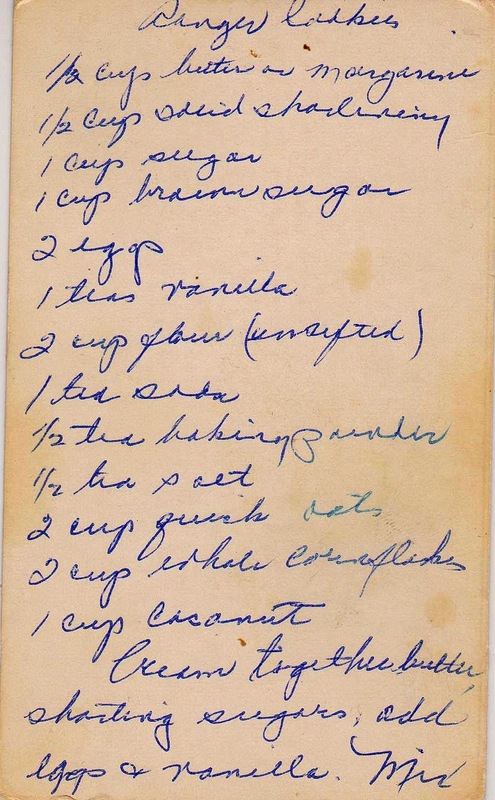 Production notes: Follow this recipe, but don't add any liquid! 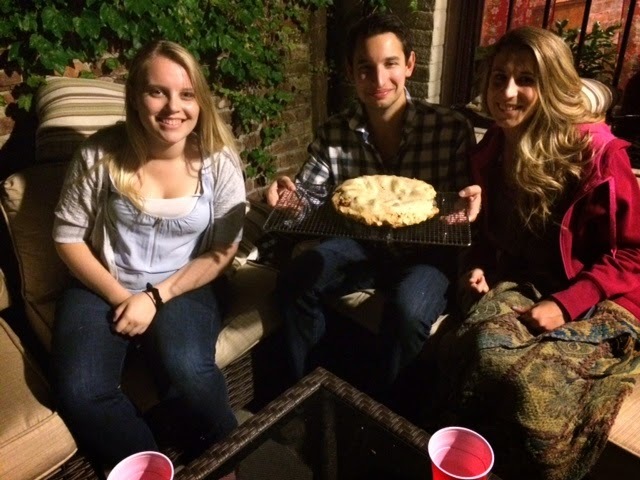 Some of our barbecue guests holding the pie, which they didn't even get to sample. 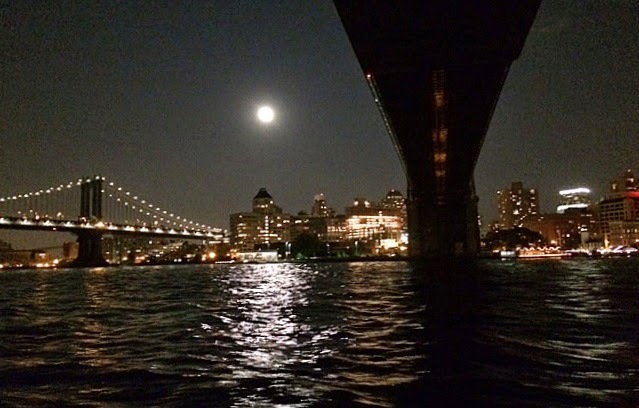 Our children and their others brought themselves (always a treat), our friends brought the wine and I brought a portable dessert -- fantastic ranger cookies in quantities large enough to share with the crew. 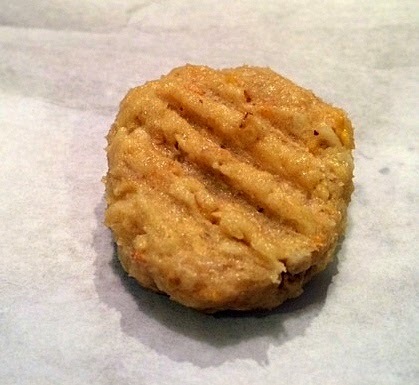 These are beyond delicious cookies, chewy and crisp, and way more than the sum of their parts. I was stunned at how good they were, especially because they called for corn flakes. Corn flakes! 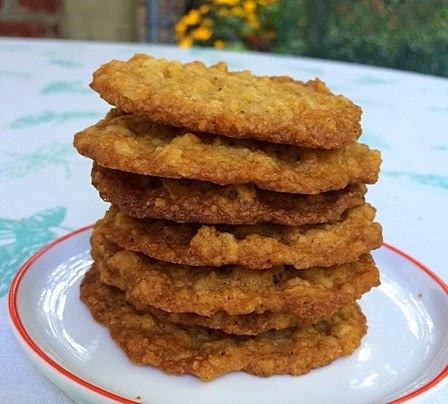 A little research revealed that while there are many variations of ranger cookies, they always contain oats, coconut and some sort of breakfast cereal, usually rice crispies or cornflakes. Begin with soft butter (two sticks! ), and white and brown sugar. 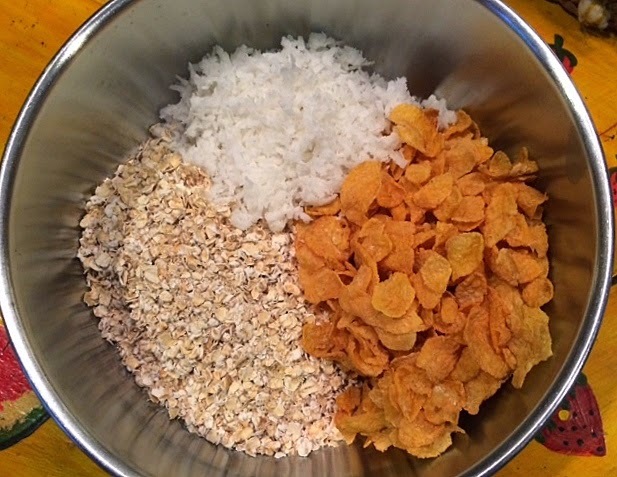 Prepare the "secret" ingredients: oats, coconut and corn flakes. Mix everything together. The corn flakes will break up naturally when mixed in to the batter. 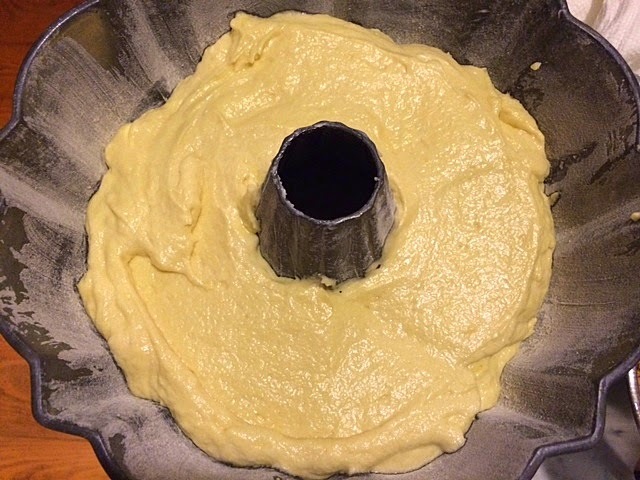 Roll the batter into small balls, about one-inch diameter. 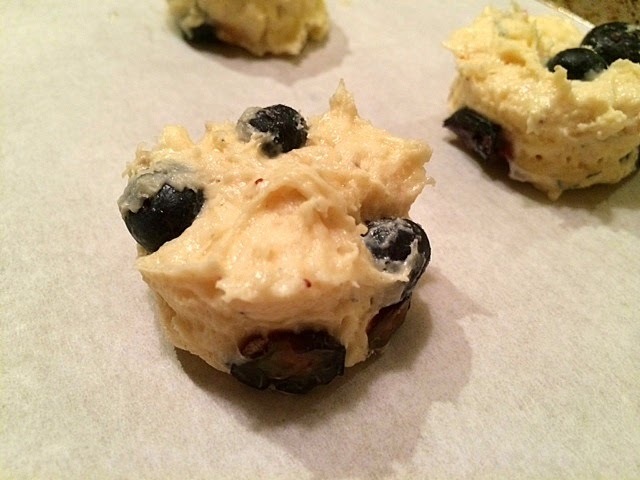 Place them on a baking sheet and depress each one with the tines of a fork. Production notes: I used all butter (no solid shortening). Because this recipe is difficult to read, I've written out instructions below. 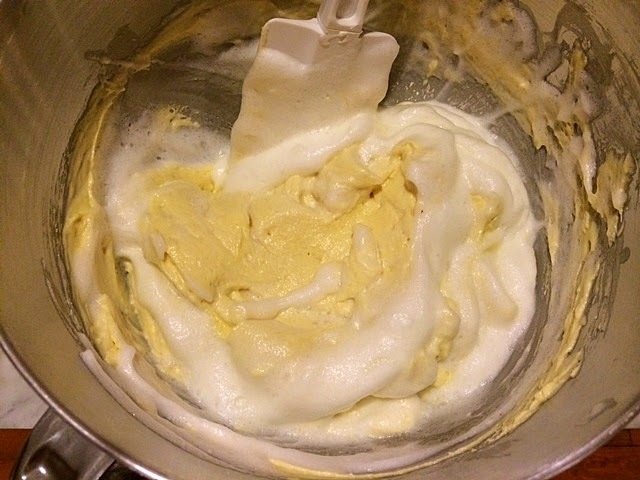 Cream the butter with the sugars. 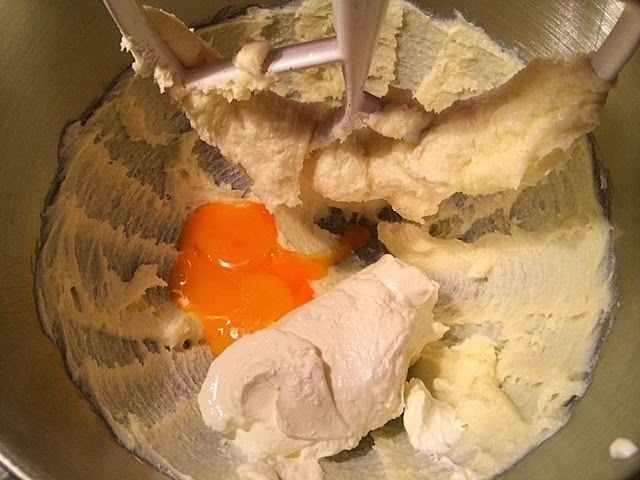 Add eggs and vanilla, mixing until smooth. 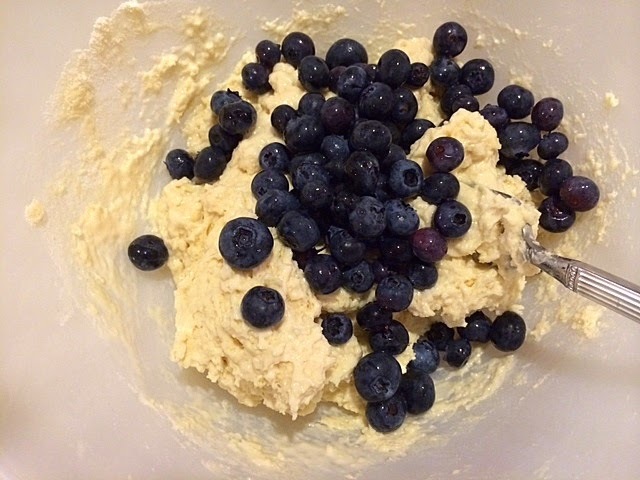 Combine flour, baking soda, baking powder and salt in a small bowl. Add to the mixture. Add the oats, corn flakes and coconut. Mix until well combined. 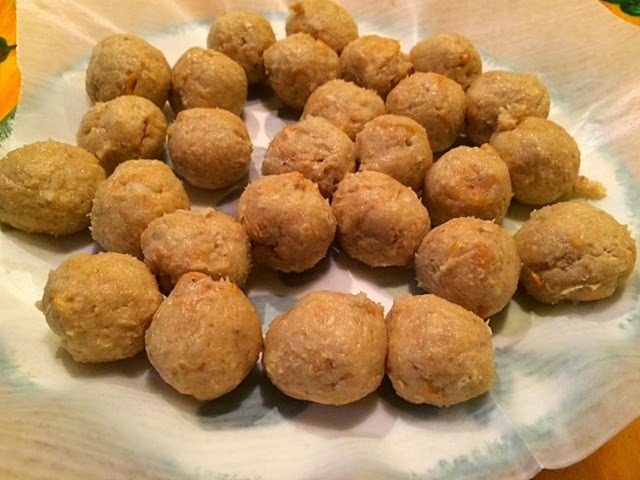 Roll into small balls and place on cookie sheet lined with parchment paper, leaving space for spreading. Flatten each cookie slightly with a fork. Bake 9 to 13 minutes until brown. Let cool for a few minutes and then remove to baking rack. 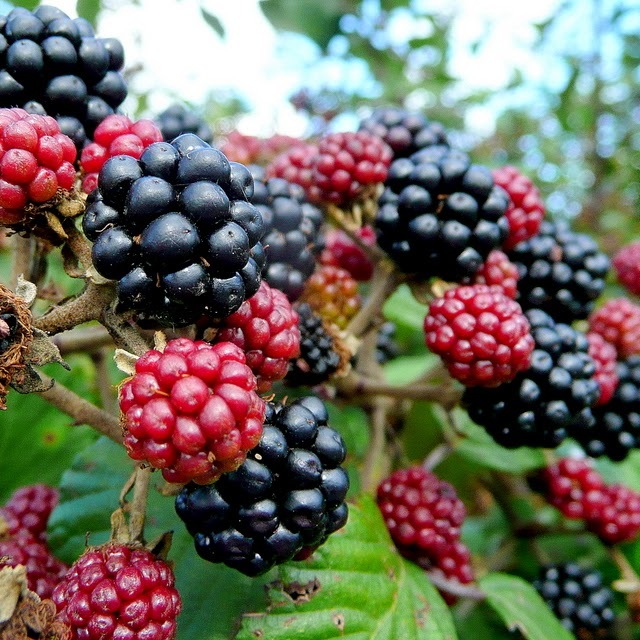 Last weekend, while in northern California, I found myself surrounded by millions of wild blackberries just ripe for the picking. So I did. 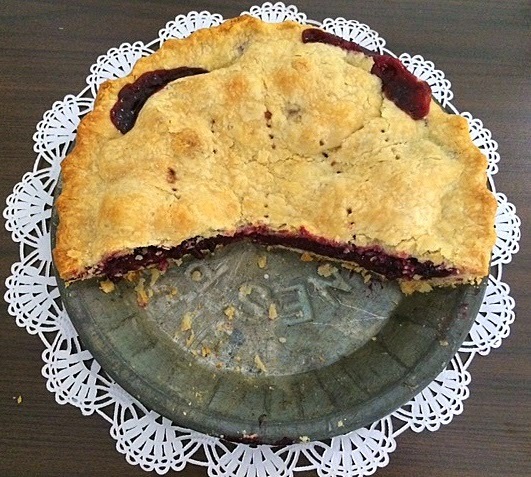 And then brought them back and made this pie. 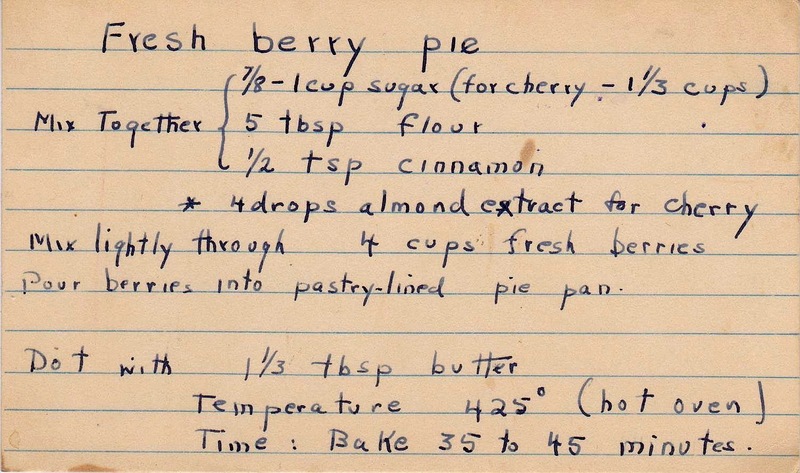 As much as I love fresh berry pies, finding vintage recipes for them is difficult. 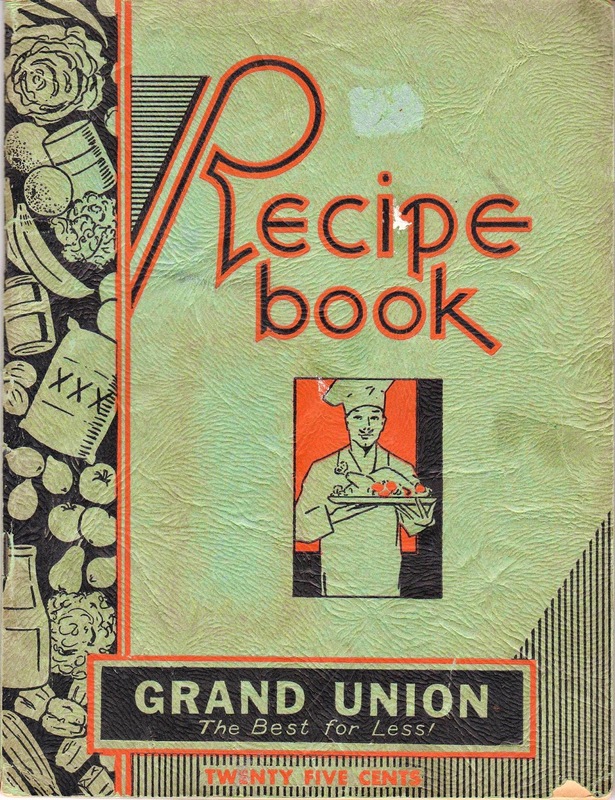 That's because in the mid-20th century, and earlier, everyone knew how to make pie -- no need for a recipe. 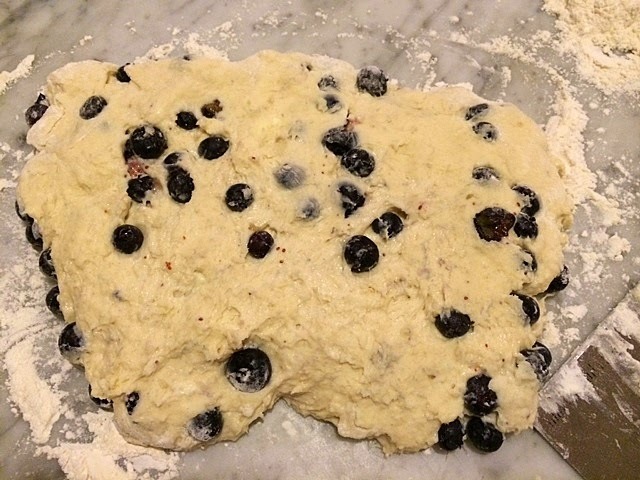 Just make a crust, mix the berries with some sugar and thickener (flour or cornstarch), cover it with a top crust and bake. 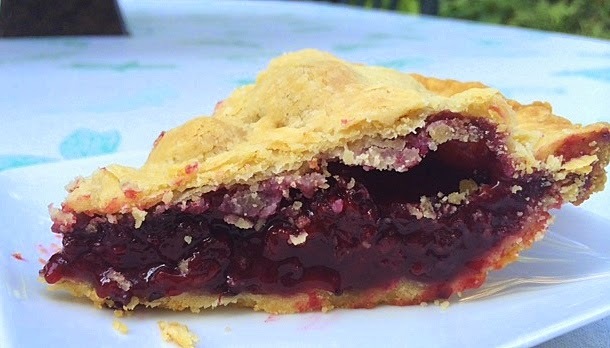 But I finally found a recipe for fresh berry pie -- a perfect ending for my blackberries, since they did not survive the cross-country journey in the most pristine condition, even though they flew in business class with the DH (while I flew steerage coach on a different airline). 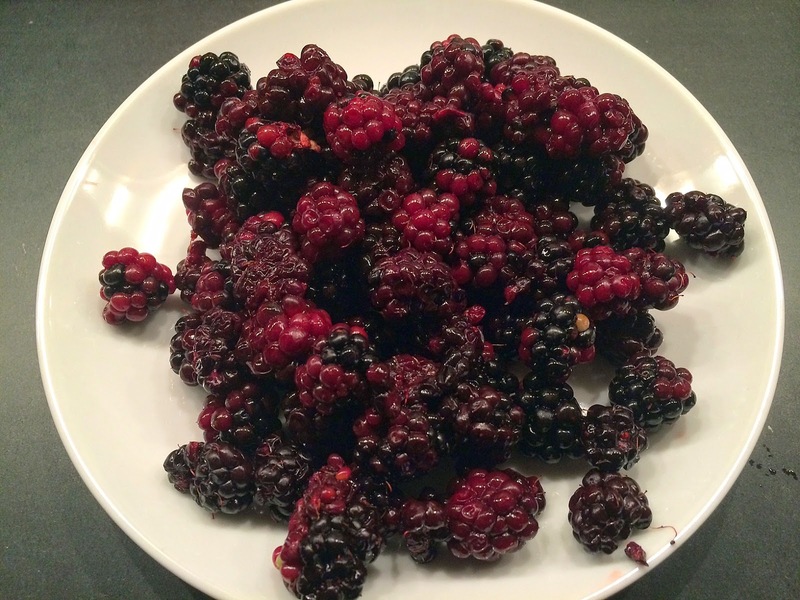 My berries, safely arrived, in New York, below. 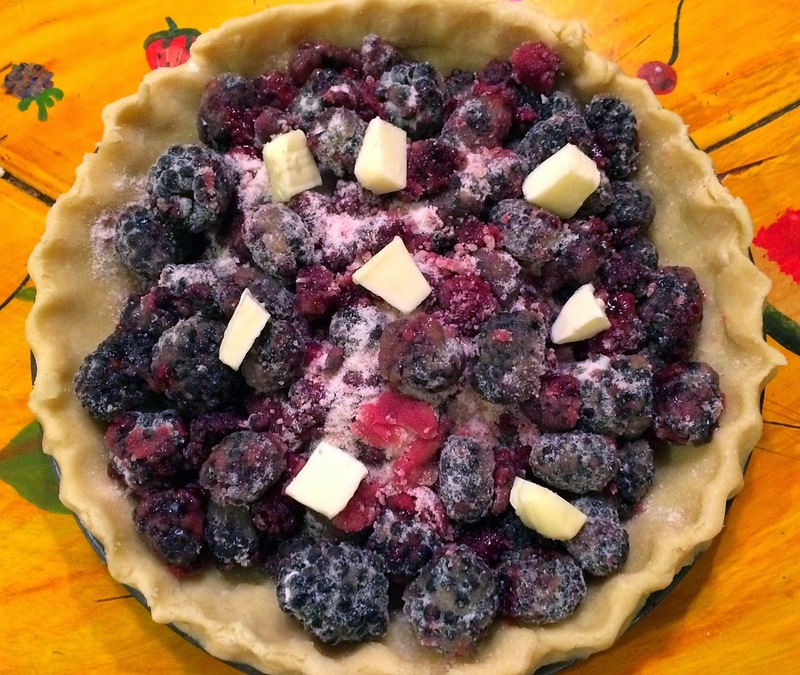 Mix the berries with sugar and flour, place in an unbaked pie crust and dot with butter. 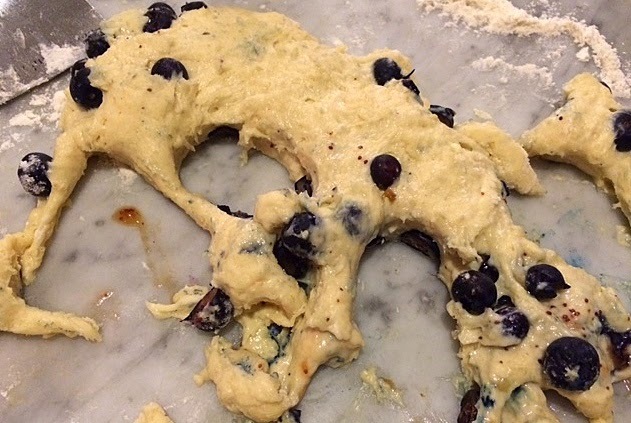 Top with pastry and punch some holes with a fork. Cool, cut and share with friends. Production notes: I followed this exactly, but added more butter than called for. 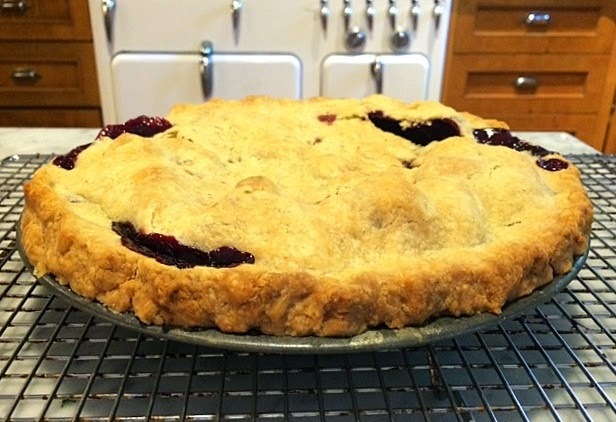 I baked it in an eight-inch pie pan, and it could have used more berries. 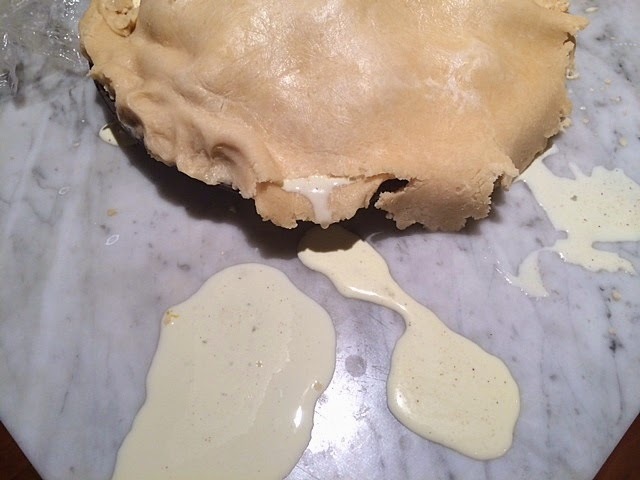 Place the pie on a foil-lined baking sheet -- this prevents the filling from overflowing onto the oven floor and makes removing the pie from the oven much easier. 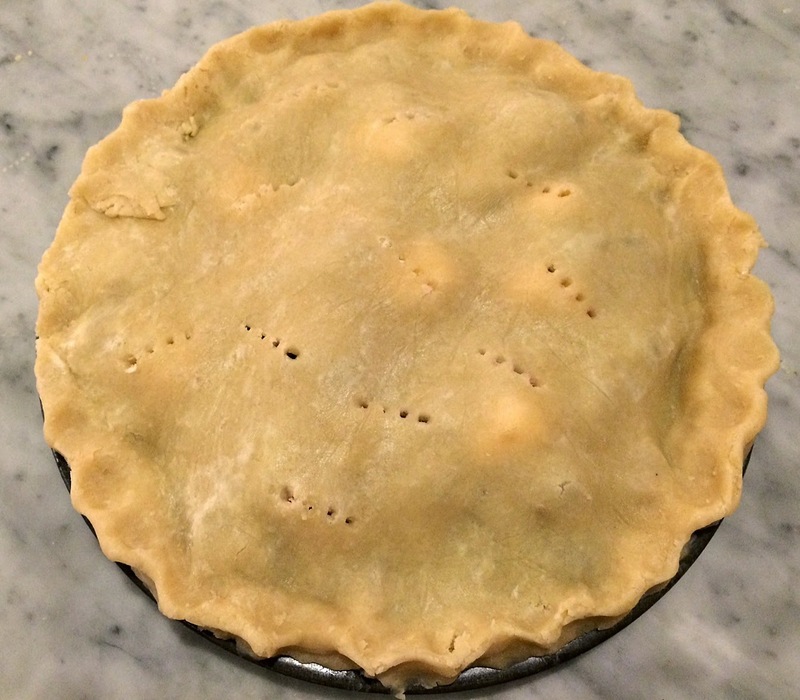 Before baking, refrigerate the pie for an hour or so, so that the edges hold their shape while baking. 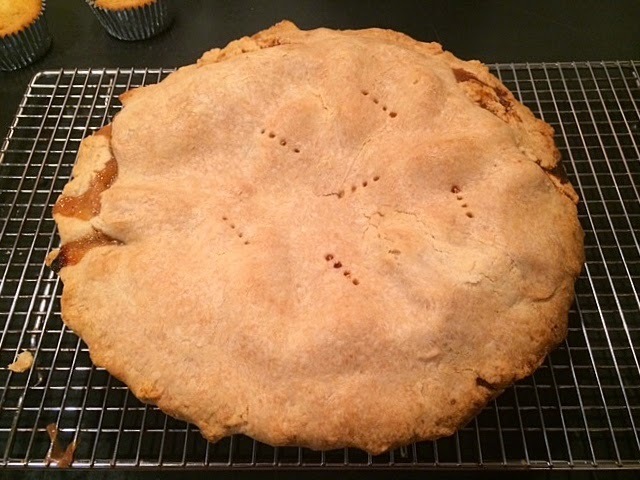 For the pie crust, I used my version of the tried and true recipe published in the original Silver Palate Cookbook, which is pretty vintage itself at this point. 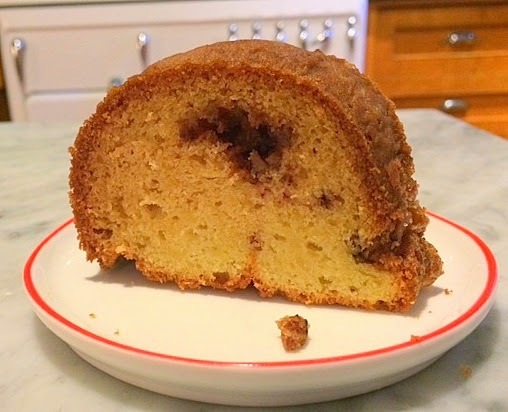 A while back, at the New Amsterdam Market, I purchased a new (for me) bundt pan, from a former caterer who was selling off his wares. 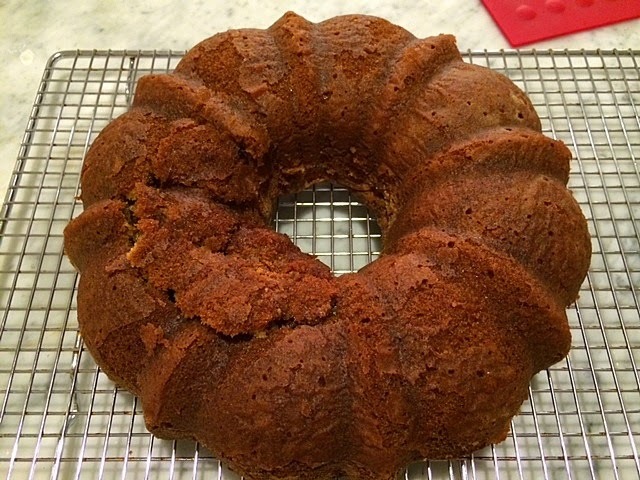 He assured me that this was the best bundt pan ever, and would put my thin aluminum ones to shame. 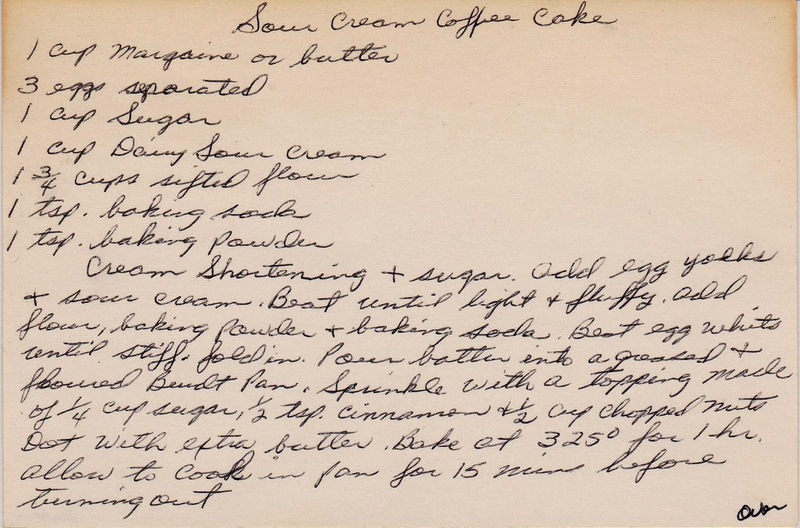 Last week, I put it to the test with this delicious sour cream pound cake baked from a c. 1960s recipe. It worked beautifully, distributing the heat evenly to creating a uniform crust. Even though a chunk of the cake didn't release, I can't blame it on the pan, but rather on my sloppy grease and flour job because (as usual), I was rushing. What's special about this cake is that the topping somehow sinks evenly into the batter during baking, turning into a filling -- creating a tunnel of cinnamon-nut-sugar filling. As always, use the best ingredients you can -- including farmer's market eggs, with their bright orange yolks. This is one of those cakes that call for separating the eggs, beating the whites and folding them in. Kind of a pain, but it does serve lighten the cake and create a more pleasing texture. 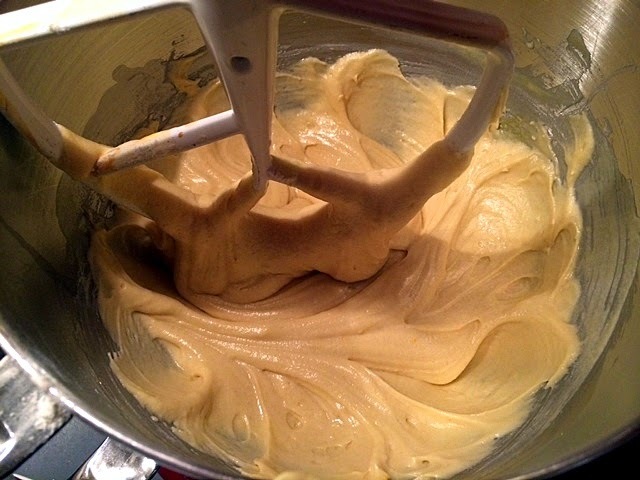 Carefully grease and flour the pan before filling with the batter. 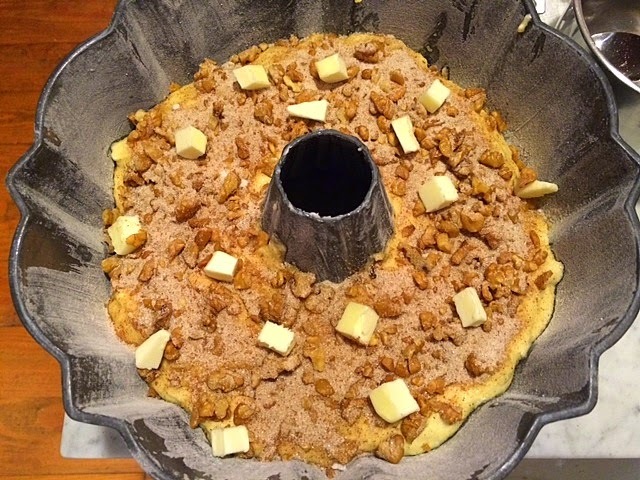 Make the topping and spoon it evenly over the batter. 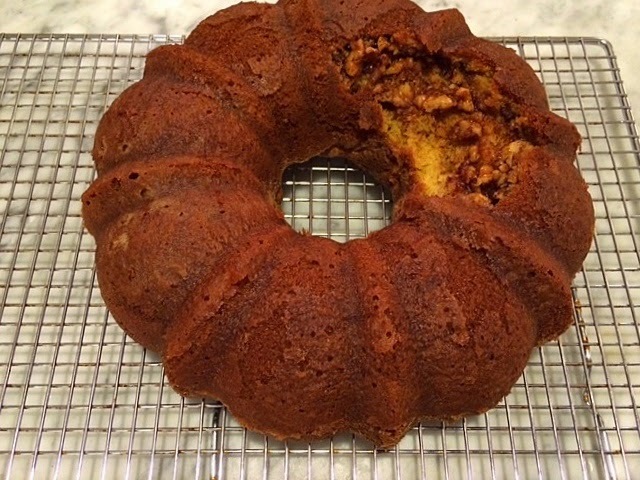 It will magically sink the center of the cake, creating a luscious tunnel of deliciousness. Below, you can see the crater in the cake, where it didn't release from the pan. Below, is the "fix" -- I simply lifted the stuck cake and placed it where it once belonged. I eventually sifted some confectioner's sugar over the cake to make it more appealing. 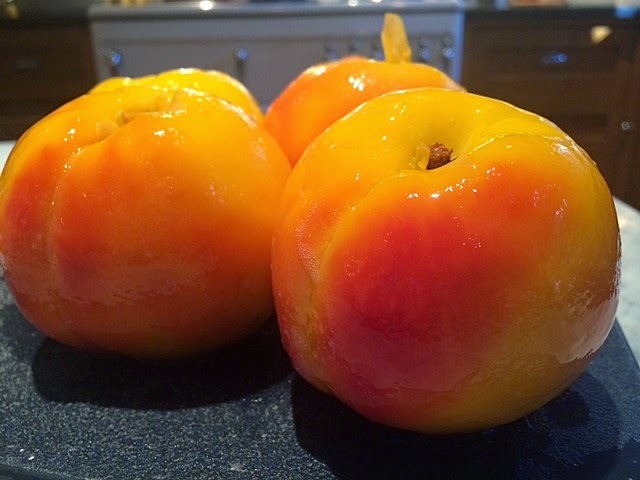 A glaze of confectioner's sugar mixed with milk or lemon juice and drizzled over would also be nice. Production notes: I followed this exactly, using butter instead of margarine. The "topping" sinks to the center of the cake, which is a good thing because otherwise, the topping would actually be at the bottom of the cake if it stayed in place. Begin checking the cake at 30 minutes. Mine was almost overdone at 45 minutes, though the type of pan you use (aluminum, cast iron, etc.) will affect the baking time.